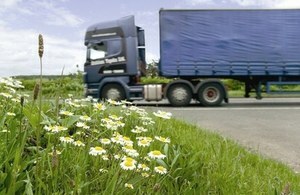 CPC Driver Training Blog: Driver CPC deadline set to be achieved . . .
New figures show that lorry drivers with acquired rights will complete their first block of periodic training by 10 September 2014. New drivers who drive for a living had to start taking the Driver CPC initial qualification from then. Existing drivers were given ‘acquired rights’ which took their previous experience into account. To stay within the rules, all drivers must do 35 hours of periodic trainingevery 5 years. Before Driver CPC was introduced, industry stakeholders were asked how many professional bus, coach and lorry drivers would need it. Their estimate was between 500,000 and 750,000. This figure was then revised following the exemption covering 75,000 valets and fitters to between 425,000 and 675,000 drivers. The current figures show that nearly 800,000 are engaged in Driver CPCand just over 564,000 have completed their 35 hours’ training. Nearly 50,000 drivers completed their training in July 2014 alone. If you still need to complete your training you can find information about the training courses available. The content of each course is the equivalent to at least a Level 2 National Vocational Qualification. Driver CPC has a lot to offer, but it’s up to you to make sure they get the most out of it. If you’re a lorry driver with ‘acquired rights’ the deadline to finish your first round of Driver CPC periodic training is 10 September 2014. You risk being fined and even losing your livelihood if you don’t finish your training in time. The Office of the Traffic Commissioner also reminds operators to be aware of their drivers’ training hours and the 10 September 2014 deadline to avoid penalties. DVSA enforcement officers already routinely check the Driver CPC status of professional drivers. After the deadline they’ll be able to check whether ‘acquired rights’ lorry drivers have completed their training or are driving illegally. Not being aware of Driver CPC is not an excuse for drivers or operators and there will be no amnesty period. Operators could also find themselves before commissioners if there are issues around the circumstances in which a driver was working without the driver qualification card (DQC), or failed to produce it. Driving professionally without carrying your DQC carries a £50 fixed penalty. Driving without a Driver CPC qualification may also lead to prosecution proceedings - with a £1,000 maximum penalty - for both the driver and the operator. These offences will also be referred to the Traffic Commissioner, which could result in the suspension of the driver’s and/or the operator’s licence.